AT-AT Cake: Hothy Birthday to You! 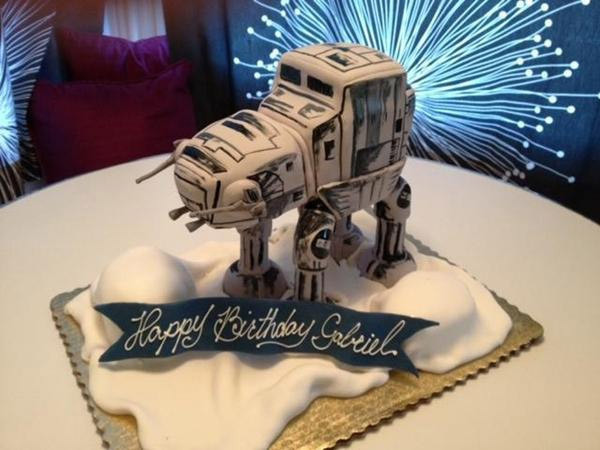 This AT-AT Cake was made by a loving mom for a four year old girl named Gabriel, and the outcome of all of this motherly love is an intergalactic win. The death machine we refer to as the Imperial Walker is stomping between what appears to be two giant snowballs, but they could also be the dome homes of Hoth citizens to cowardly to face their doom with rifles in their hands. This is almost like a “too-soon” joke that just creates awkward tension. You invite a couple of the old Rebel veterans over to your daughter’s birthday party, and what do they see? An AT-AT modeled after those which blew up everything in the war against the empire. You’re going to have a lot of cleanup to do after they all go into battle mode and start tearing apart your cake with their sidearms, not to mention all of the complaints from the neighbors. I’LL PLAY THE EMPIRE THEME AS LOUD AS I WANT TO, FLANDERS. If you love this AT-AT Cake, chances are, you’ll love The Other AT-AT Cake and the Death Star Cake, which was also made in bad taste. Those people who floated through space for years after the destruction of Alderaan are disgusted at your shamelessness, and are retracting their gift of fruit salad. And Alderaanian fruit salad? SO GOOD.